Our Bokrijk workshops contain enhanced content for interactive and informative activities that take place in a real workshop. With this option, your group firstly follows an interesting and interactive route that gives them insight into the artisanal product process of baking bread, making honey, pottery as well as leather, textile and carpentry. You choose the workshop route that fits you best. 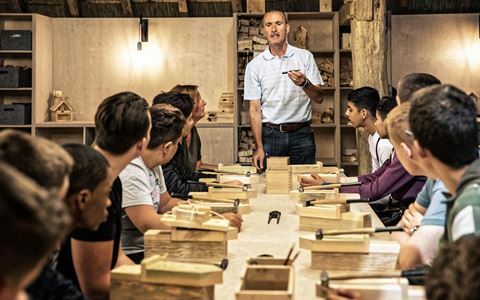 Every route is interchanged with one of the specially equipped workshop barns where the children can learn the basic techniques of a craftsmanship and be active themselves, creating something as a result. This workshop route starts with a workshop of 1 hour, followed by a tour of 30 minutes. During the route, the children learn about raw materials, the craftsmanship itself and the daily use of pottery. Your group discovers how and from where that pottery went all the way to the countryside and how people used to treat cutlery. Without modern equipment, making a wooden beam from a tree and a house from wooden beams was much harder than it is now. During the route you will see tools from back then up close! But please be careful, wood burns! The class also learns about the dangers of fire and how people protected themselves from fire in the past. Bread...the basic nourishment of human beings. During the route it becomes clearer that back in the day you wouldn’t just go to the bakery for a sliced white bread. Once a week the woman would bake bread in the baking house, using grain the farmer himself had harvested and which had been grinded by the miller. That it smelled, tasted and even looked differently? Back in the day, animals on the farm were no pets but useful animals. Even the dog! During this route, your students will learn about forgotten products and traditions. From cows’ manure in the stable to the dog in the butter wheel. Also when animals were butchered, no part of the animal would be lost: knucklebones were used to play with. On this route you will be immersed in Bruegel’s imaginative landscapes. At various points, you will discover more about everyday life, clothing and games from his era. People in the 16th century often wore headgear, usually made of leather or textile. In our workshop we keep up that tradition but with hats made of paper! Using different types of paper and unique templates, the children can create fantastic examples for themselves. Who will conjure up the most beautiful hat creation? There will be lots of laughter! Back in the day, materials for clothing came from the land...or from an animal like sheep’s wool. What is the origin of authentic clothes? How were raw materials spun by hand and woven into a tunic or trousers? Without modern dyes, the result looked totally different. Feeling and comparing with your own jeans and T-shirt…it’s different!